Over three hours long (don't worry, you don't even notice that you've been sitting there that long until you try to stand up). Personally, I prefer longer movies; especially in dramas. I almost feel cheated otherwise. 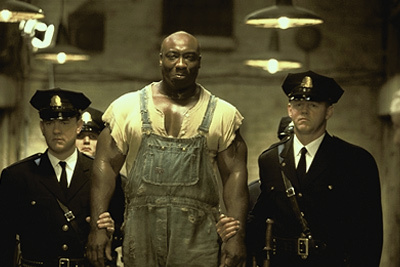 Written by Stephen King and directed by Frank Darabont (the duo who brought us The Shawshank Redemption), The Green Mile immediately vies for its position as one of the best of the year. Set in the most dismal of circumstances and surroundings, we find men with compassion and dignity. Perhaps this film's greatest achievement is in getting us to "do some time" at "The Green Mile," a euphemism for Death Row and so named for its lime-green floor tiles. Almost the entire duration of the film takes place inside the prison, and it is here, in the most unlikely of places, that miracles occur. But before we even get to that, we first see how these prison guards treat their inmates as people, allowing them to experience one last joy of life before their time runs out. Played basketball at Kankakee Community College. After college, spent several years digging ditches for the gas company in Chicago. The rest of the cast was good as well. What is great about the film is that so many are able to contribute. The best performances came from the ones with the smallest screen time (such as the old people in the nursing home). Tom Hanks didn't steal the show, but he did bring us a believable character who trys to do the best he can with a terrible job. 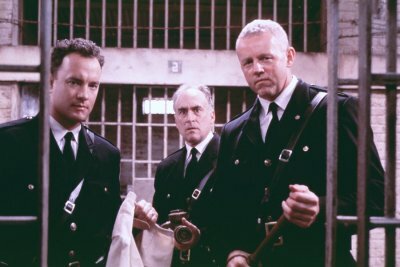 I think that anyone who watches this movie will really like Brutus "Brutal" Howell (David Morse) who was quite admirable as the prison's largest (but towered over by John Coffey) guard. 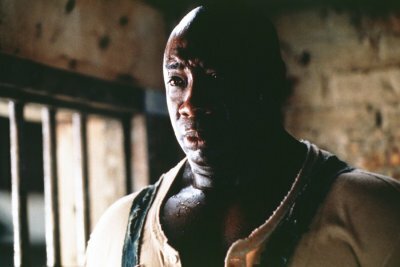 What is really intriguing is that he is, in real life, only 1 inch shorter than Michael Duncan, who plays John Coffey -- Morse is 6'4" and Duncan is 6'5". It appears to be almost a foot difference in the movie with the camera angles and other tricks of the trade. I was also quite angry at Percy Wetmore (played wonderfully by Doug Hutchinson, who was also hated as one of the rapists in A Time To Kill -- pictured to the right), and I was both angry and slightly amused at "Wild Bill" (Sam Rockwell). Patricia Clarkson, as the brain tumor sufferer, Melinda Moores, was superb. She has very little screen time, but what she gave was perfect. I also felt that Barry Pepper (Saving Private Ryan) was cast perfectly for Dean Stanton. The best casting job was that of William Sadler (I hope I got that right) as the two girls' father. None other could have possibly done as good a job. I can still hear him urging the guards to "Kill him twice!" One thing that really bothered me though was when Melinda Moores' tumor was removed by John Coffey, suddenly she had makeup on. But, perhaps, this was part of the miracle -- not just a healing, but a makeover. Perhaps this is what the movie is meant to do -- to make us feel better about ourselves that we would not be so cruel and selfish and so compelled and loyal to "the system" as to give away our very souls. Or, perhaps, the movie was simply meant to make us cry. And that a happy or just ending would take away from its powerful effect. Finally, it seems that the movie's spiritual and biblical overtones are unmistakably spelled out here, with Paul re-living the life of Pilate. Some more food for thought centers around this movie's take on the death penalty. It is quite interesting to note that those who were put to death did nothing wrong on screen. We lamented all 3 executions, even though 2 of them, we assume, were indeed guilty for their crimes. 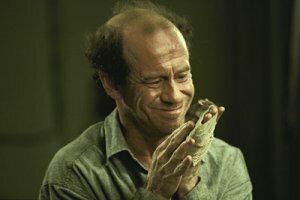 In fact, Michael Jeter's portrayal of Eduard "Del" Delacroix (pictured to the left with Mr. Jingles) was one of the most sympathetic characters in the film. This is when you know that you are watching a good film: when you are able to have empathy for the "bad guys," (case in point -- The Godfather). On the other hand, Wild Bill and Percy were portrayed as being devoid of anything that is good. But what I am really getting at is that this movie seems to make a real case against capital punishment (or at the very least, against the electric chair, which, even with a wet sponge, does not look "painless"). What was perhaps the thing that stands out the most upon reflection is the frequency with which people were grabbed by the reach of the inmates through their bars. This must have happened at least 10 times. I would like to think that in a real situation that either the guards would be more careful or that there would be a double layer of bars so as to prevent this from occurring. But, then again, it did make for some exciting moments on screen. Another interesting aspect to this film is the fact that at least a half hour of screen time is devoted almost entirely to Mr. Jingles...the mouse. I am not sure what this mouse's name is in real life (he was somehow omitted from the credits), but I would look for him in upcoming movies, because he is going to be a star (too bad that he was passed up for the role of Stuart Little!). I also enjoyed watching Harry Dean Stanton (Dr. Ludwig from Young Doctors in Love) as Toot-Toot, who I am assuming is the prison's janitor. He was great as the smart-talking practice-run executionee, so to speak. He and Mr. Jingles (though not on screen together) provide the much-needed comic relief in this film, making it bearable and endurable, as well as making the sad and tense parts even more so. To sum it all up, this movie is definitely worth seeing. It has so much to offer. Very powerful. Very touching. Very introspective. 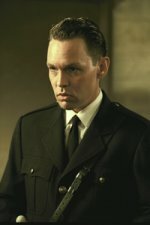 How would you rate the movie The Green Mile? There have been 30740 people to visit this page since Fri, Dec 17, 1999. And you are the first person to visit this page today!